Shouxian Located along the banks of the Huaihe River and at the foot of Mt. Shouxian. 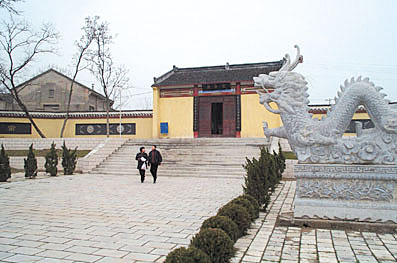 Shouxian is a famous ancient cultural city established some 2,000 years ago. During the late period of the Warring States (475-221 B.C. ), King Kaolie of the State of Chu moved his capital here. During the Western Han period (206 B.C.-A.D. 25), King Liu An of the State of Huainan made Shouxian his capital. There are many places of historic interest, such as Anfeng Pond, the Tomb of King Liu An, the Pearl Spring, and Kuiguang Pavilion. The well-preserved ancient city wall is 10 meters tall, four meters thick, and 7,000 meters in circumference. It is a good example of defense work in ancient China.